We're going to Walley World! Last night I watched Vacation (2015) with Sarah and my Hollywood-crazed sister Margot. The movie had been on my radar ever since the trailer zipped by on Facebook, quickly drawing me in with the fun chemistry between brothers Kevin and James. I remember immediately forwarding the trailer to Margot, because I'm pretty much the dingus older brother and she's 200% the twisted smaller sibling. Going in, I expected a non-committal comedy in the mold of We're the Millers (2013), but with Hangover star Ed Helms replacing SNL alumn Jason Sudeikis and Amy Green Christina Applegate replacing Rachel Green Jennifer Aniston. Let's ride! 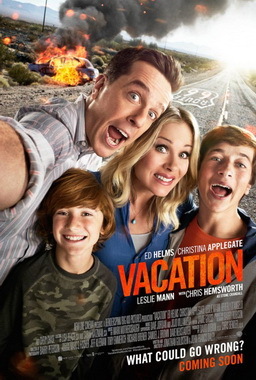 Forgoing their annual family trip to Sheboygan to appease his wife Debbie (Applegate), Econo-Air pilot Rusty Griswold (Helms) decides that a road trip to Los Angeles amusement park Walley World is the best way for his family to spend some quality time together, especially since his awkward older son James (Skyler Gisondo) and obnoxious younger son James (Steele Stebbins) aren't exactly on friendly terms. Rusty rents a Tartan Prancer, the ultimate Albanian family truckster, and begins an across-country trek that hits more than a few snags along the way. As the Griswolds visit Debbie's alma mater in Memphis, are robbed in Arkansas, visit Rusty's sister Audrey (Leslie Mann) and her well-hung husband Stone (Chris Hemsworth) in Texas, and nearly get arrested in Arizona, the family's resilience is on full display. Vacation marks the fifth movie in the National Lampoon's Vacation series and the first one since 1997's Vegas Vacation. While aping the National Lampoon formula, Jonathan Goldstein and John Francis Daley don't get much farther gross-out gags and paedephilia jokes in their directorial debuts. There's nothing wrong with that, at least in my book, but the 94-minute result is not something that has a lot of staying power. 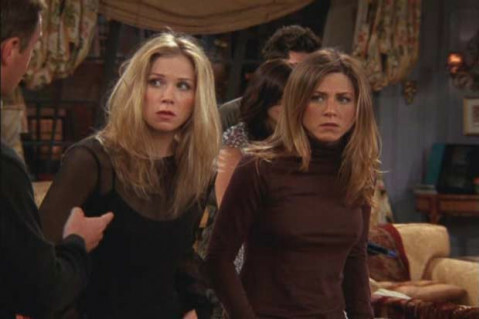 Overall, the actors make the most of the mediocre material at their disposal, even if I won't be giving this sometimes cringingly-embarrasing followup another look soon. I did, admittedly, very much like the chemistry between Kevin and James, Chris Hemsworth's cameo and of course the always-on Charlie Day as heartbroken Grand Canyon White Water Express guide Chad.